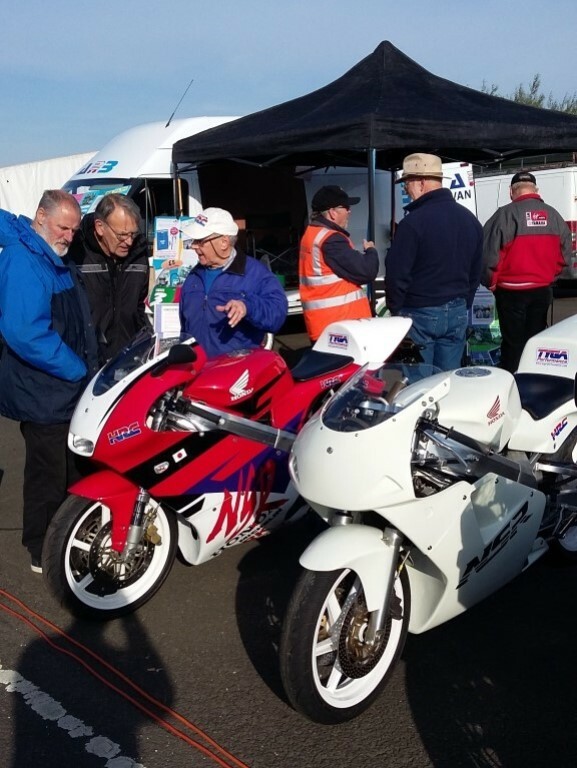 The Tady Okada replica road bike was our first NSR and was imported to the UK by Performance Motorcycles in Darwen in 2002. 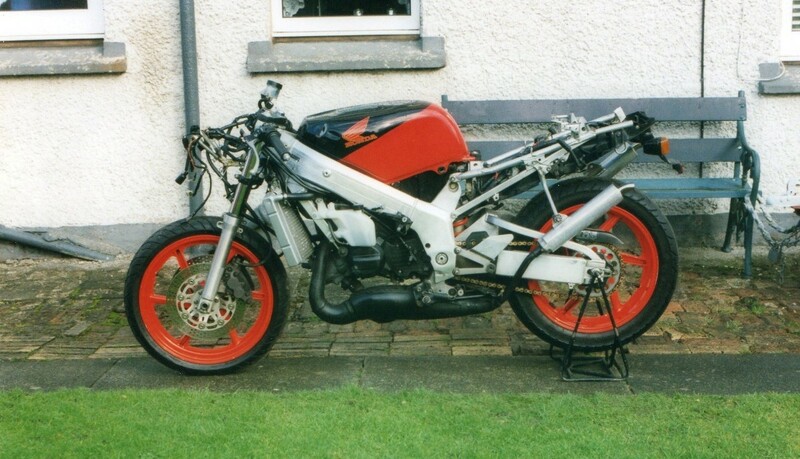 It was around 80% complete and was in a dire state of disrepair with front end damage to the forks, front wheel, all bodywork, clocks, pipes and evidence of a hard life being imposed upon it by it’s previous owner who had fitted an alternative top yoke with upright handle bars. After strip down, we cleaned and assessed every part and anything showing signs of wear, corrosion or damage was consigned to the bin. When the engine was apart the cylinders where matched to the crank cases, some mild porting work was carried out, (mainly to the boost port and exhaust port) the RC valves were modified to straighten & open up the cross sectional area of the exhaust port and a general refreshing of bearings, seals and the top end was performed. The chassis was in remarkably good condition after cleaning, probably due to it never having being subjected to the British winter road salt as it had never been registered in the UK. With the engine mounted back in the chassis, a straight set of forks and a replacement front wheel were fitted, we then replaced every fastener with either titanium, stainless steel, or at very least, brand new OEM Honda parts leaving us with a corrosion free rolling chassis and a freshly rebuilt engine in a sensible state of tune for road use. We fitted HRC reed block stuffers, reed petals, jet kit and a set of HRC TT-F3 pipes (TYGA supplied J) which we sent off to our local platers to be dull nickel plated. 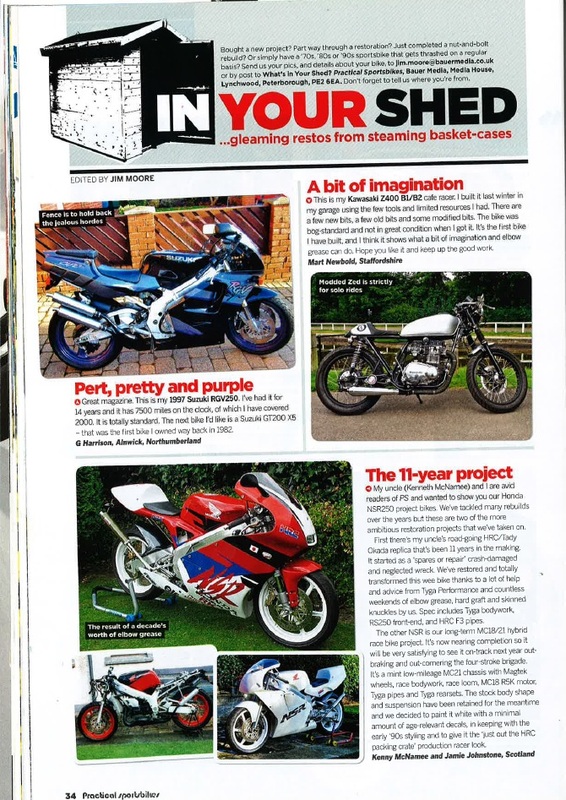 At first we bolted the bike together with a set of standard body panels which received a quick rattle can paint job to make it presentable for road testing and to allow us to get on with registering the bike and setting up the carburation. We modified the air box lid, wire spliced the gearbox position sensor to remove the restriction to the ignition advance and jetted on the side of caution initially for its first outing. After performing plenty plug chops and jet changes we had it carburetting perfectly off the needle and the mains. 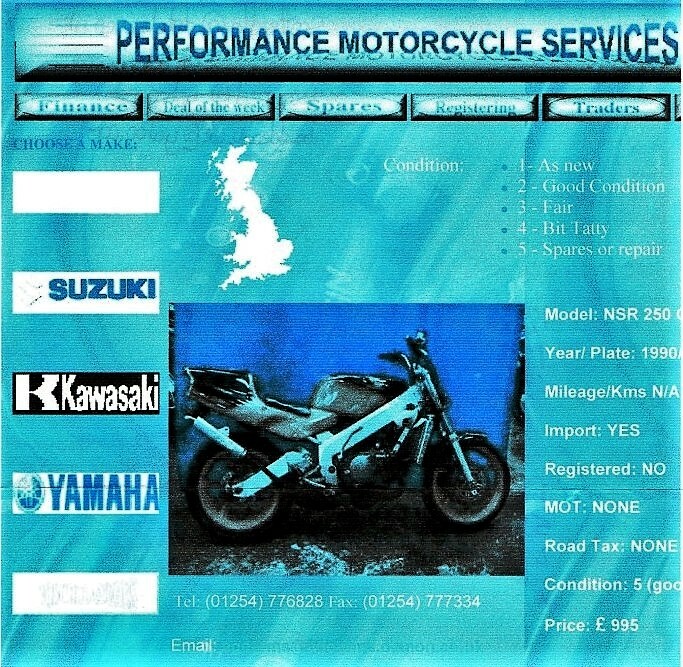 My Uncle used the bike for a year with this set up and found it to be a total revelation in terms of handling and performance compared to the 2 strokes he had owned in the past. He was very happy with the performance but conscious that our efforts on the chassis and engine were being let down by less than perfect standard body panels. We wanted to bring the styling up to date and upgrade the suspension and brakes so an NX5 Honda RS250 front end was sourced and the triple clamps sent to TYGA for modification. A set of VTR1000 firestorm disks had the correct off set, bolt pattern, pitch centre and disk diameter to avoid any messing around with spacers or caliper mountings. When we bolted this lot together it looked like a factory fit and Matt’s CNC machined concentric steering lock adjusters are one of the many neat detail touches that make this bike so special to us. 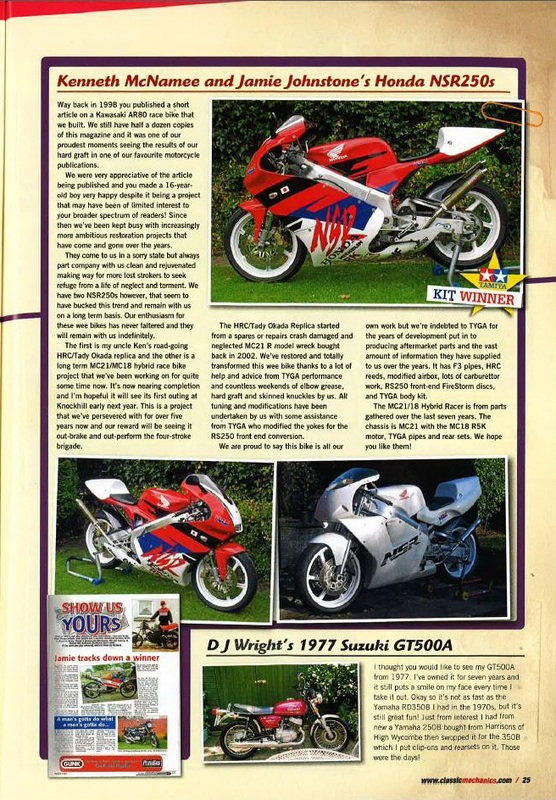 TYGA's ever growing list of project bikes at the time inspired us to fit the GP250 body kit and as everyone was opting for Rothmans or Repsol paint schemes we decided on HRC/Tady Okada colours which were expertly applied by Bike Paints in Cupar. 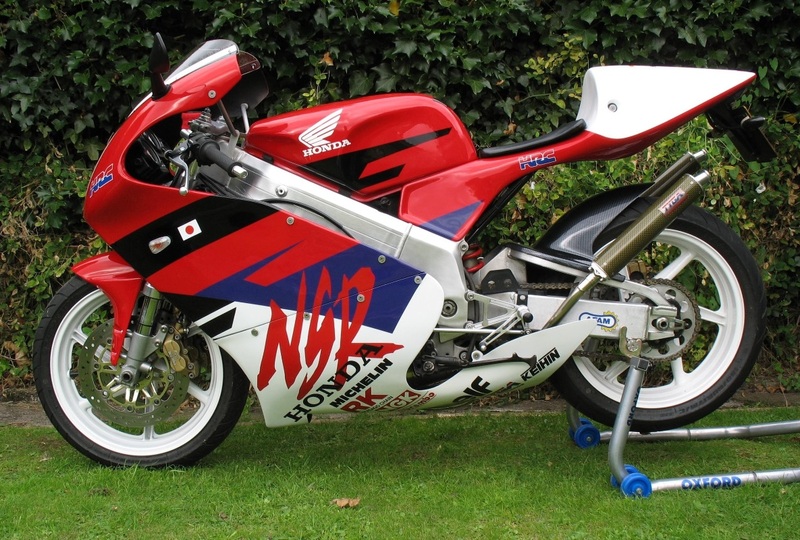 The bulk of the restoration happened over a 2 year period with countless weekends of elbow grease, hard graft and skint knuckles but our wee bike continues to evolve 13 years on as TYGA continue to produce more aftermarket parts for the NSR250. We have TYGA to thank for many of the new and second hands parts required to build the bike you see here and we are extremely proud of our efforts but are indebted to TYGA for the technical support provided over the years. Thanks again for all of TYGA’s assistance over the years!